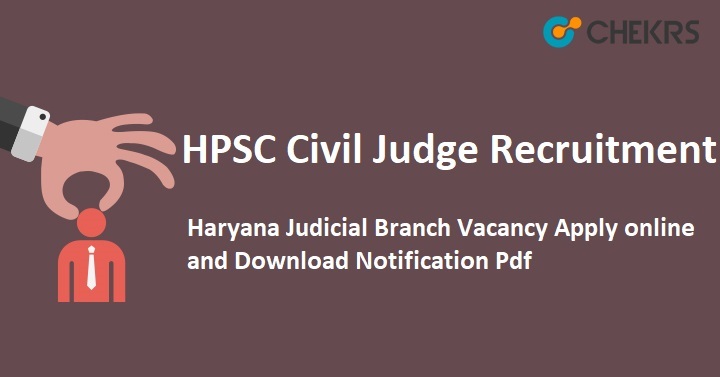 HPSC Civil Judge Recruitment 2018: Haryana Public Service Commission has announced notification for 107 Vacancies of Civil Judge. The HPSC Department is going to fill up all the positions of the Civil Judge through HPSC Civil Judge Recruitment 2018. Candidates can apply for an application form before 30th September 2018. This is a great opportunity for those candidates who are Searching Government Jobs in Haryana State. You can read information about the Haryana Judicial Service Vacancy 2018 from here. Now select your Discipline Post and click on “Continue” button. The candidate must read this Notification carefully. Click on “Read & Continue” Button. Application Fee will be deposited through online Challan. Remarks: For more information, we can update soon about HPSC Civil Judge Recruitment 2018 and we are providing the latest update related to upcoming Recruitment on our website that is www.jobs.chekrs.com. If you have any query about HPSC Recruitment that you can write comments on commenting box and take a review or feedback.